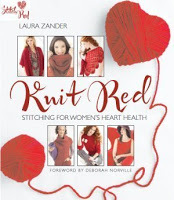 Have you gotten your Knit Red book yet, which supports women’s heart health? There’s a knit-a-long with the book, an A-Line Hoodie … just in time for cooler weather! Go check it out! Related posts: Nora Bellows on Her Book “Noni Flowers” REVIEW: Knit Red New Upcoming Book: Knit Red!